If you often cook pasta at home, you may definitely need a good quality pasta maker machine. To get a decent appliance, today you don’t have to break your bank. Actually, most of the pasta makers come at meager $50 or less. If your budget allows and you use the pasta maker too frequently, it is really worth to spend on better quality product. You will find a range of both manual and electric pasta makers listed here. Manual models may take little more effort but they are affordable and simple to use. A lot of manual pasta makers are hanged on the countertop and work with hand crank. 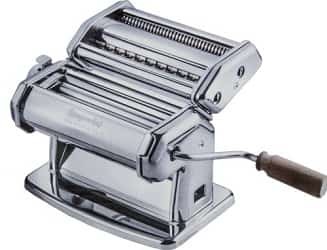 However, some manual pasta makers are not rust-proof and shouldn’t be cleaned with water. So look for cleaning instructions. On the other side, electric pasta makers are more convenient and easier to use. In addition, they have several options to make different types of pasta. You simply have to make dough and feed it in the maker and wait for the machine to do its job. Even better, some electric models are more advanced as they can mix up the ingredients automatically. However, electric models are more expensive than manual machines. Cook’s Illustrated has described Marcato’s Atlas Pasta Machine as the Ferrari of the world of pasta machines for all good reasons. It cuts and rolls pasta dough very nicely to make typical Italian pasta at your home. Nothing is tastier than authentic and fresh homemade pasta and you can make fresh pasta with ease. You can make three different pasta shapes with ease – fettuccine, lasagne and tagliolini. 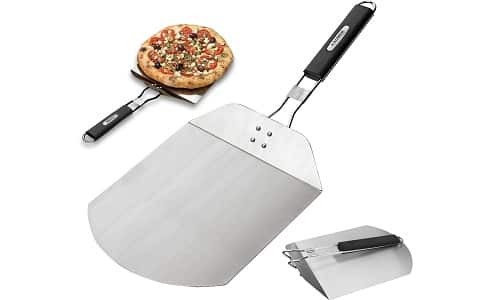 It features adjustment dial which controls the thickness of the dough and rolls pasta dough at home evenly for consistent cook time, texture and taste. 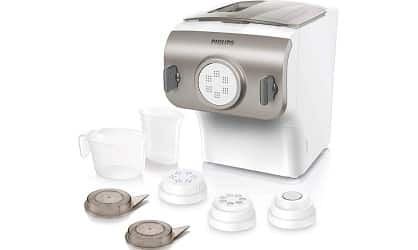 This is one of the best electric pasta maker you can buy online, Now cook fresh and tasty homemade pasta with Philips Avance Pasta Maker with powerful functions for automatic kneading, mixing, and extruding. You can make fresh noodles or pasta within just 15 minutes. Prepare healthy and delicious homemade noodles and pasta by adding healthy ingredients like spinach, egg, and carrot juice. There is no end of various pasta colors, shapes and flavors this machine can make for you. This pasta maker machine from Imperia is well known for their ease of use and high quality. 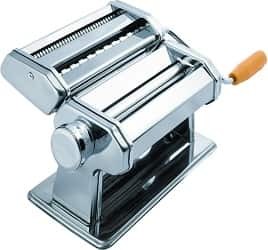 From its wooden handle and solid steel to its quick table clamp, Imperia Pasta Maker Machine has all the attachments you require to make farfalle, spaghetti and fettuccine. It is a complete package bundled with your own pasta recipe book to get started and expand your repertoire. 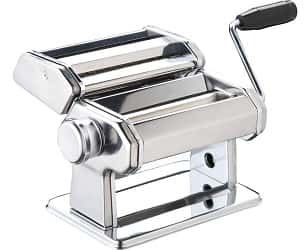 Make fresh homemade and delicious pasta at home with VonShef 3-in-1 Pasta Roller Maker with different pasta thicknesses. Whenever you want, enjoy fresh pasta with your family. You can easily turn ingredients into different pasta dishes. You can also treat your family with delicious lasagna with different layers of egg pasta. You can adjust the pasta maker to make pasta in different thickness as per your culinary requirements. It also includes pasta measuring tool and table top clamp to make the best pasta every time. The VonShef Pasta Machine is both stylish and sturdy and is a great addition to your kitchen. Pasta is one of the first dishes come into mind when planning meals for family. Pasta dishes are obviously very easy to make and they are always top on the list. There is nothing better than doing it at home. Innovee Pasta maker can make delicious pasta meals at your home without spending a dime. Preparing fresh pasta is a tasty and fun experience for your friends and family. CucinaPro deluxe pasta maker is designed well to make healthy homemade pasta with ease. It has three different attachments to prepare authentic ravioli, spaghetti and lasagna. Whether you are making pasta for your family or catering for tonight’s dinner, this pasta maker is built to add authentic taste to your pasta dishes. It has everything you need to make fresh fettuccini, spaghetti, ravioli, angel hair, and lasagna at your home. Made of strong aluminum and stainless steel, HuiJia Wellness 150 Pasta Maker won’t get rusted easily and will also last longer. It comes with all attachments you need and its handy design includes inbuilt pasta roller. The package includes clamp with handles, hand crank, and wide and narrow cutters. In short, the machine includes all the attachments to make ideal pasta at your home. You can adjust 9-position dial of dough roller and control the thickness of dough as you like. 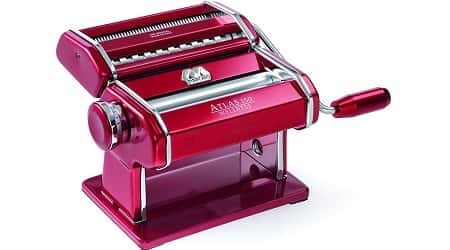 The Atlas Pasta Machine from Marcato cuts and rolls pasta dough to prepare delicious fettuccine, lasagna, and tagliolini pasta dishes at your home. The package includes pasta cutter, pasta machine, clamp, hand crank, 10 years’ manufacturer warranty and complete guide. 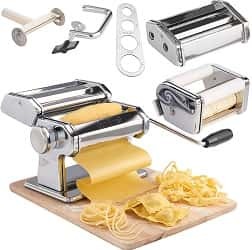 Make three different shapes of pasta and it is equipped well to have any of 12 accessories to cut pasta or a Pasta Drive motor. In addition, the pasta maker is also easy to clean and use. Marcato is a household name in making pasta makers. Its aesthetic style, quality, and function are reflected well with attention to technical innovation and love for tradition. The rollers have rugged surface to make porous pasta that can easily absorb the sauce and to give you rich and authentic taste. 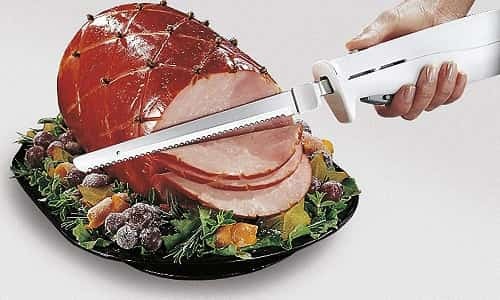 It has easy to control handle for processing the dough with ease. You can adjust your pasta for ten positions to choose the desired thickness. 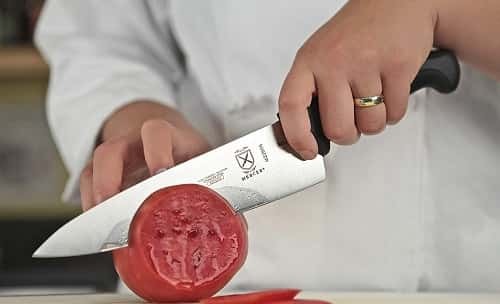 OxGord is the leading brand in making home and kitchen supplies. This premiere pasta maker can help you make tasty linguini, spaghetti, Angel Hair, and Alfredo pastas at home. Make the delicious al dente pasta and enjoy with your favorite creams, sauces, and meats. Made of robust stainless steel, OxGord Pasta Maker gives years of culinary delight to you and your family and it is built to last. You can enjoy whole wheat pasta from your home with time-tasted culinary recipes. 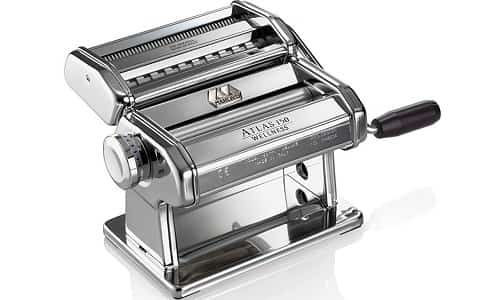 Click adjustable dial to roll dough to nine thickness layers for ideal homemade creations of pasta. Make delicious traditional style pasta at your home with Meglio AEPM01 Pro pasta maker. It is very easy to roll out dough and put it in the cutting rollers. You can make different types and styles of pasta with ease. Pasta maker makes it possible to make homemade pasta which is definitely tastier than the one you get at the grocery store. 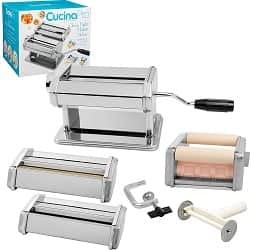 The Pastamaker which includes manual pasta roller and the automatic pasta maker will help you make homemade pasta fast and easy. 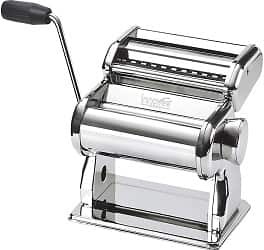 Cost – While the manual roller costs less than the automatic pasta maker, it is indeed difficult to make pasta using the manual roller. 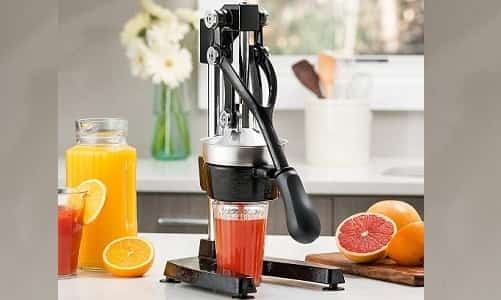 Therefore, it is better to opt for the automatic pasta maker because it would do you no good to buy a manual pasta maker considering the cost and not putting it to use at all. There are many reasonably priced automatic pasta makers as well as higher priced ones are those that enjoy great brand reputation. Consider a pasta maker that you are comfortable to use even if it costs slightly more. Ease of use – The high-end electric models come equipped with facilities to knead the pasta dough too for you. The ease of use increases with the type of machines that comes equipped with a greater number of features and designs which makes pasta making as simple as a loading the ingredients into the machine. Speed – Automatic pasta machines are no doubt faster than the manual ones. Different brands claim that their product would be able to deliver pasta faster. When you buy, you need to compare the claim s with the reviews to ensure that it is right. Ease of cleaning – As pasta maker involves dealing with the dough which is sticky and it has a lot of nooks and crannies it would indeed be very difficult to clean and maintain it. There are machines that come with dishwasher friendly parts, you can opt for such a machine if you find cleaning, washing by hand a difficult chore you do not like to do. The reviews will give you a fair idea about the ease of cleaning and help you to decide the pasta maker you want. 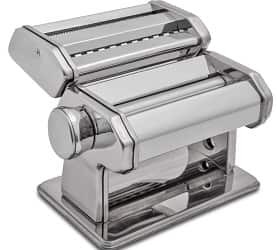 Durability – Generally, the manual pasta roller would outdo, the automatic machines in this ground. The electric motor in the automatic pasta maker generally is believed to wear off considering the electric motor that you will find in an automatic pasta maker. But, there are indeed certain pasta makers from reputed brands that feature quality motors that are made using quality materials that would last longer. Warranty – Since the automatic pasta maker is equipped with a motor, it is better to choose a pasta maker that comes with a reasonable warranty period. The first step in cleaning and maintaining the pasta maker is to read the manual of the automatic pasta maker and following the cleaning instruction given there. The cleaning instructions suggest that water should not be used to clean the pasta maker. It is to prevent the equipment from rusting. The new machines, as well as the machine after use, would have greased rollers. If it is only surface grease just wipe it off with a paper towel. Alternatively, in the case of a new machine, you may run a lump of dough through it once or twice to remove the grease. If it is not surface grease you may consider folding the paper towels over to form a thick piece and dampen it with vinegar and wipe the grease-deposited surface. If you are sure as to how to dismantle the pasta maker, you may consider doing it. in such a case you may then wash it with water, dry it and then fix it after greasing it with the oil that is used for food preparation equipment. You can deal with stubborn starch sticking to the surface by using 4:1 bleaching solution and soaking the affected part with hot water. This would soften the starch that is sticking to the pasta maker. You can then wipe it off the surface using a scrubby sponge. You can use a mild degreaser to clean the exterior of the pasta maker. We hope you enjoyed the article and you can make decision on the right pasta maker for your kitchen according to your budget and needs and save a lot of time for yourself. According to the convenience, type, cleaning, warranty, cost and storage, these pasta makers will definitely be a good investment for you.